Trash is our middle name, and we're the best in the business. When you're opening up your new office, restaurant, shop, or whatever it may be, you'll need to secure a way to get rid of all the trash that is produced week by week. That's where we come in. We'll help you keep your business on track by helping you to keep it a clean and friendly environment. From the moment you call in, we'll work with you in every way possible. 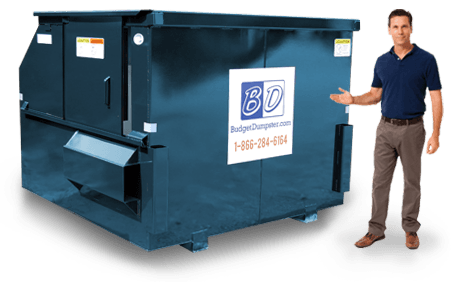 We're all about customer satisfaction at Budget Dumpster. We have years of experience and therefore we're able to use our knowledge to bring you the best possible service. If you ever have a problem with your services, we will work with you until it is made right; that's our promise. You'll get the royal treatment with us. Our customer service representatives are highly educated and know the industry like the back of their hand. On top of getting the best services, we'll bring you the lowest prices. We love to make our customers happy, and we wouldn't have it any other way. 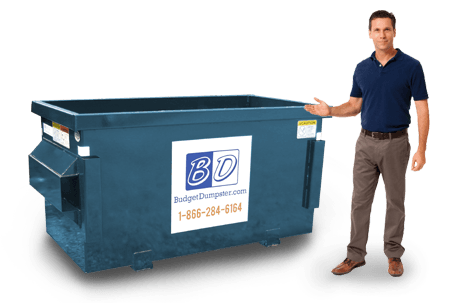 Once you get the Budget Dumpster experience, you will never want to rent your dumpster through any other company again. To get started, all you have to do is give us a call, send us an email, or use our live chat feature to get an instant quote. Don't let the small size of the 2-yarder fool you. This compact little cutie is still mighty powerful. 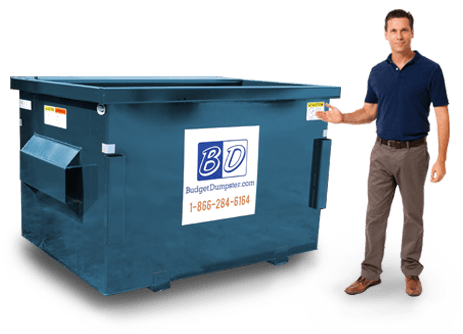 If you don't have much trash from week to week, but still need a weekly removal service, this could be the perfect option for you. Common renters are those who have a business that occupies a space of less than 2,500 square feet. Its small size will fit into just about any space, but it will still hold just about as much as the back of one pick-up truck. The walls are only three feet high, making it a breeze to fill up. 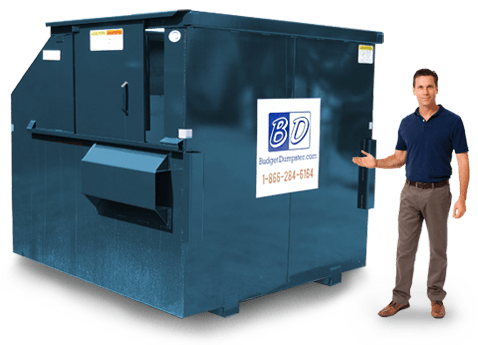 The 4-yarder is perfect if you're looking for a dumpster that isn't too big, but isn't too small either. It is twice the size of the 2-yarder, but it still maintains dimensions that are easily place able just about anywhere (6 feet by 4 feet.) The wall heights are still manageable at 4.5 feet tall making this a great easy loader. Those who most commonly rent this size include small retailers, medium restaurants, and offices of up to 5,000 square feet. The 6-yard size is the one you'll see just about anywhere and everywhere. It's quite the popular choice and versatile for a wide range of needs. This baby has dimensions of 6 feet by 5 feet, and has walls that are a little taller than its smaller companions. Those 6 feet walls do come with a sliding door, meaning you won't have to lift any trash over your head to get it into the dumpster. It will hold up to 1,400 pounds of trash and is commonly rented by grocery stores, large restaurants, apartment buildings, and large offices. If you're looking for the biggest of all commercial dumpsters, this is it. This big fella is meant to handle large amounts of trash on a weekly basis. It can even handle some bulky items. It is best used for the largest warehouses and corporate settings, large apartment complexes, shopping centers, and other gargantuan office buildings. The sides tower high at 7 feet, but luckily there is again a sliding door on the side for easy access to the inside.